NEW Personalized Zodiac Bracelets from Amigami! Amigami is proud to present an amazing line of custom & personalized Zodiac Bracelets. These bracelets are constructed from a cornucopia of semi-precious gemstones, meticulously arranged to mirror the planets positions at the moment of your birth. Designed by Amy Barnhart, an amateur astrologer with over 15 years experience, these bracelets are calculated from your individualized birth data (date, time & location), so no two are exactly alike! Each bracelet comes with your corresponding star chart, a 15-page handwritten Zodiac analysis, and a bookmark detailing the stones and instructions on how to Read your new Bracelet. These bracelets are perfect for those interested in Astrology, and make the ideal gift for that special someone in your life. These are also perfect for mothers – you can have one for each of your children – a far more meaningful and unique keepsake than a mere birthstone! What is a Star Chart? When someone reads their horoscope in the newspaper, they are actually looking up their Sun Sign. This is determined by the movement of the Sun through the Zodiac constellations at the moment of their birth. But Astrology is much more than the position of the Sun – all the planets in the Solar System can be tracked through the Zodiac constellations, and each of these planets are said to have their own unique influences. The combination and interaction of these planetary forces make up a total personality forecast, which is far more precise and revealing than merely looking at one’s Sun Sign. Each bracelet measures 7.5 inches long, which will fit most wrists. I can happily extend the bracelet upon request when ordering. 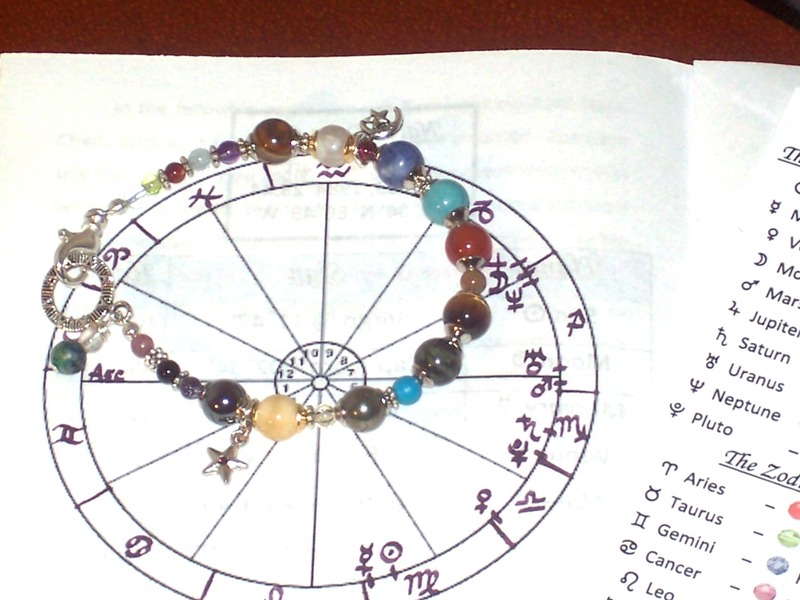 Please allow 5-7 business days upon placing your order for the completion of your Natal Chart, Bracelet and Analysis – each is completely personalized and take some time to complete. You will receive: A Zodiac Bracelet; a 15-page handwritten analysis, including your Star Chart; a Bookmark detailing the Stones; and a Black cotton-lined Gift Box. Great for novice astrologers, or anyone intrigued by the Heavens! Also a perfect gift for Sweethearts & Mothers! This gorgeous bracelet is a one of a kind keepsake that is sure to be treasured for years to come. Check out what's for sale at Amigami's Etsy Shop!